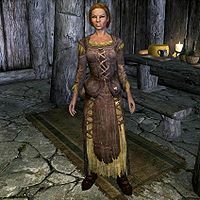 Julienne Lylvieve is a Breton living in Dragon Bridge, where she works at the Four Shields Inn. She is the daughter of Azzada and Michel, and sister of Clinton. Her ambition is to own an inn for herself someday, and she is learning from Faida the ins and outs of running one. She sleeps in the family's house from 1am to 8am, then wakes up and wanders around the house. At 9am, she heads to work in the Four Shields Tavern, sweeping the floor for three hours and stoking the hearth for two hours. She continues working until 8pm, when she returns home to eat a two-hour dinner with her family. She wears a set of farm clothes and a pair of boots. She carries a selection of common items and gold, the key to the family's house, and a simple iron dagger. Julienne will quickly tell you about her goal of running an inn one day: "I'm hoping to run my own inn someday." She will then elaborate on this, telling you how she is learning the necessary skills to run an inn: "Faida's teaching me the innkeeper's trade. She runs the Four Shields." She may receive more attention from the local men than she wants, as she may say to you, "Please stop looking at me like that." She will also comment about how grim current events have been: "First the war and now there's talk of dragons. What's next?" Julienne: "Miss Faida, may I ask you a question?" Faida: "Of course, Julienne. What's on your mind?" Julienne: "What do you do when a customer can't afford to pay for a meal or a drink?" Faida: "Since my customers are mostly local, I just knock on their front doors the next day." Faida: "Mind you don't forget to sweep up, Julienne. The floor's looking a bit dusty." Julienne: "I won't forget. I'll do it after I get the dishes cleaned." Faida: "You've been working hard lately. You'll make a fine innkeeper someday." Julienne: "If the Nine are willing!" Julienne is a member of the warrior class, which determines the level of her skills. This page was last modified on 13 March 2018, at 23:55.